1. 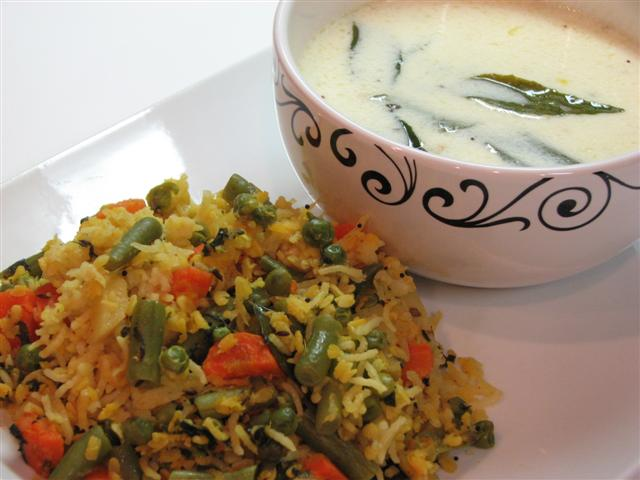 Wash rice and moong dal in running water. Soak in 2 cups of water and keep aside. 2. In a big pan, heat butter /ghee. When it is hot, add all the masalas and stir-fry for about a minute. 3. Add rice and mung dal along with the water. Stir in vegetables and salt. 4. Increase the heat to medium high. Let the khichdi boil for 3 minutes. 5. Reduce the heat to low, cover the pan and cook for 8-10 minutes until khichdi is cooked. Khichdi is done when all the water is absorbed. Hi ! Mr . Shah , Tried this Khichdi yesterday with little changes . Very delicious . Thank you . Hello, my family loves this khichdi.I am adding tuvar dal and and moong fada along with other dal and rice.